It’s a brand new world out there. It used to be enough to provide a good product or service to your community. Then word of mouth was bolstered by well written and placed advertisements that heralded the benefits of your product and service, along with an endorsement from the Better Business Bureau. The next step was, sadly, misleading ads and a loss of trust in advertising. And now, thanks to Facebook and Yelp, among others, we’ve come full circle. Not only is word of mouth back in vogue, but a whopping 88% of consumers say they trust online reviews as much as their best friend’s recommendation. The numbers don’t lie – 80% of people who read a negative review online will go elsewhere, one negative review can cost you an average of 30 customers, and angry people are 2-3 times more likely to take the time to post a negative review than your happy customers will find to post a positive one. So how do you increase the number of positive reviews, minimize the negative reviews (here’s a hint – don’t ignore them), and boost your presence on reliable review sites, without irritating your customer base? The simple answer: Just Ask. I know what you’re thinking, “Are you kidding me?” probably with a few extra choice words mixed in. But don’t worry, I’ll break it down for you. It should go without saying (but I’m going to anyways), that the first step is to create a high-level of customer service and satisfaction, delivering quality, on time, useable products and services and not lying. If your house isn’t in order, then what I’m going to share here won’t make a bit of difference. I’m also going to caution you to steer away from sites and salesmen that promise they can get you lots of likes and reviews and positive PR to lessen the impact of negative reviews. The same goes for firms that advise you to challenge or outright bully anyone who posts a negative review. You may see some positive upticks in the beginning, but those approaches tend to be far more harmful than good and if you’re discovered buying or manufacturing good reviews – and 75-85% of people who try it are caught – they can get your business blacklisted from the review sites all together. If it’s expensive, sounds too good to be true and looks unethical – trust me, it is. As I mentioned earlier, long gone are the days of the BBB and only having one place to research a business. There are now literally dozens of review sites, both general and for specific industries to keep an eye out on. And that’s not even counting Twitter or random Facebook posts that don’t hit your page. I’ve listed the top ones to keep an eye on below, but at the very minimum, you’ll want to either find and claim or build your business profile on Facebook, Yelp, Google & Yahoo. If you’re a local business, add Angie’s List to that, and if you’re travel-related, add Trip Advisor. The key is to have plenty of options on several platforms. Everyone has Facebook, and it’s the leading platform for positive reviews. And most everyone else has Yelp, the leading platform for negative reviews. It’s essential to at least have a presence on those two sites, and the leading search engines. Once you’ve created or claimed your company profile on each site, note the exact URL where reviews can be posted. You’ll need that later. Of course, this only works if you have an actual brick and mortar business or you host events where you see people face to face. But in person is the gold standard of review requests, so if you have the opportunity, take it. This can be as simple as letting your customers know that you’d like them to leave feedback for your business. Then, “We’re on Facebook and Yelp. Sharing your story on either one would be appreciated.” Notice that you didn’t ask for a review, which technically violates Yelp’s policies, but also leaves just a hint of negative language in their mind. Feedback is more neutral, and ‘sharing their story’ is subtly encouraging them to add more specific detail, which tends to improve a reviews value, both for the site and the people reading it. Story sells. There’s an old joke – “You wanna tip? Don’t bet on the horses!” It’s not just the corniness of the pun that makes that joke less funny these days. Especially as prices for everything get higher, people are less inclined to give a monetary gratuities, especially to people outside the typical service industries. But that doesn’t mean they’re adverse to rewarding someone for great service. Depending on the relationship, it doesn’t even have to be monetary. I had a gentleman that always assisted me at the storage facility I used. He said something similar to the above, and just said it would earn him praise from his boss. We had a good relationship and he always gave great service. I left the review, citing his name, and the next time I came in, I found out I had improved the whole month for both him and his boss. If you don’t feel comfortable yet directly asking for reviews, you can post a sticker or sign in the window with the Facebook, Google & Yelp logos to let people know you’re there. This also works in an email signature, just don’t overdo it with the links. If you’ve been around for a while and have a good rating on Yelp, they send you a frameable letter and “People Love Us On Yelp!” Proudly display both to encourage your new and existing customers to share their feedback online. This is similar to the face-to-face meeting, just electronic and a little less personal. But it is still effective, especially when worded the right way. You should already have an email follow-up set for every time you interact with your customers. If you don’t, click here to learn the three things small business owners need to do to succeed. “If you had a good experience, we invite you to leave your feedback online. You can even offer an incentive, like a percentage off coupon code or free shipping discount on their next order, as long as you don’t specify that they have to post a good review. (You should automate a response with the code for once they’ve left the review as well). But What If They’re More Established Customers? It’s a little trickier asking your long-time customers for reviews, but if handled properly, they likely won’t mind. In this case, it would be better to use an “existing customer survey” to bridge the gap between the email and the request for public feedback. The survey would remind them of their (hopefully positive) experience, and the final question would include a link to share their story on Facebook or Yelp. Or you can just flat out ask, but that’s more of a one and done email. Repeating it, like the incessant “Review Your Purchase” ones from Amazon, is far less effective and may backfire. Regardless of which customers you’re contacting, be sure to have a clear and obvious call to action. Remember those URL’s you saved earlier? This is where you use them. Make sure the button for each is clearly marked and is linked directly to the exact spot on the platform where they can initiate a review of your business. You want to make this as easy and seamless as possible. Too many options can be overwhelming, and too few runs the risk that they don’t have a Yelp or Facebook account. You want to make getting to the correct spot and leaving positive feedback as easy as possible. 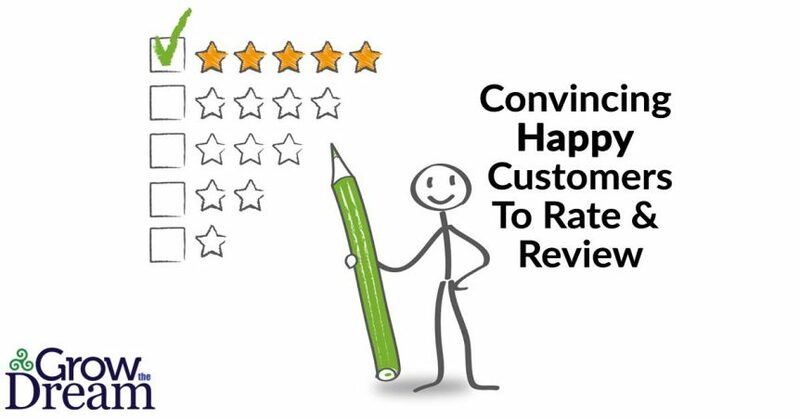 As mentioned above, you can offer incentives to your customers to leave reviews – not positive reviews, just A review. (And again, it’s better to say ‘feedback’ or ‘share your story’) You can offer a sweepstakes, drawing, a discount code, or even a lead magnet. It doesn’t have to be big, expensive or a hassle for you. And again, you should use a program like Infusionsoft to automate the sending of the incentive once the review is approved and posted on the platform(s). Bonus Round 2: Thank Them! But there can be a very powerful benefit to publicly thanking your customer as well! Anytime your customers leave feedback on Facebook, Yelp, or another platform that allows you to respond, DO IT. First off, it sets your company in a good light, but it can also be effective SEO. Two more powerful words to consider: “I’m sorry.” Use these words, along with the above sentence for responding to negative reviews. Follow it with the appropriate mea culpa, “we apologize that your experience wasn’t up to our usual standards. We will strive to do better in the future.” When handled properly, yes, PT Barnum was right: all publicity is good publicity. This takes a little more finesse, but can be a valuable tool in improving your online profile and your website. Make your customers the center of attention. Yes, I know they already are – or should be – but literally throw them into the spotlight by highlighting referrals, testimonials, and the best feedback from the review sites. In the case of the third parties, only put a few lines of their story on your site – ideally with a picture of your featured reviewer – and a “Read More” link to the original review. It’s a three-button combo move for your site: you get the positive feedback, SEO credit for the link out, and more people pointed not generally to Facebook or Yelp, but specifically to great reviews on their site, boosting your presence there. Remember, not everyone will get around to giving you reviews, even when you ask. That’s just the nature of the business. But if you stress the importance of reviews to your employees and incorporate the task of making the request into your regular business routine, before you know it, you will start to amass an impressive amount of reviews. But they probably won’t think about it, unless you ask.